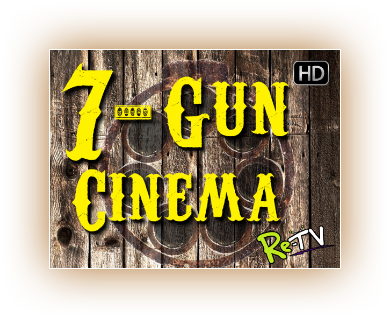 RE-TV presents the all new 7-Gun-Cinema! It's all the glory of Six-Gun-Cinema with one more barrel! We're talkin over twice the content of the original! A 24/7 channel for all day access to classic western movies and your favorite television western series. Join classic Western stars from the A to the Z with the likes of John Wayne, Roy Rogers, Gene Autry, Hopalong Cassidy, Tex Ritter, Johnny Mack Brown, Bob Steele, Kermit Maynard, Hoot Gibson, Tom Tyler, Buck Jones, The Range Busters and so many more! We got you covered with all the feature films, B-westerns, and TV shows you know and love. TV shows from The Adventures of Jim Bowie to Wagon Train and a show for every letter in between! Re-live the tales filled with ranchers, homesteaders, rustlers, horse thieves, renegades, gold filchers, stage line drivers, and lawmen sworn to uphold justice. If you don’t add this channel you don’t have the right to call yourself a Westerns fan! Tune in to 7-Gun-Cinema for a western explosion!